The right tool (needle) for the job. Having talked about technique, I am going to focus on the qualities of a range of different needles referencing my own technique and needs but also referring to other knitters whose skills and opinions I value, so you get a fuller picture. I’m limiting this post to the choice of needles available for garment knitting – in particular needle sizes from 3mm up. Sock needles have some different options. I think it is useful to start with an analogy to something you use every day – cutlery, as in knives, forks, spoons and chopsticks. Most of the time we don’t even think about how well cutlery works until something we eat creates a challange – a knife isn’t sharp enough, we struggle to eat rice. Knitting needles are a lot like this – in many ways they are a very simply constructed tool and as long as some basic parameters are met they will do the job they are designed to do – help you create a knitted fabric. There are also times when you are eating out or pick up a peice of cutlery in a shop and pause because you notice it has a nicer “feel” than your normal utensils. Good knitting needles can be bit like that. So what are the basic parameters for any good knitting needle? These apply to all types – straights, DPNs and circulars. They need to be smooth – certain materials are more slippery than others, but you need to be able to run your hand down the length of a needle and not feel like it is catching on anything. Probably the most likely needles to have a catch along the length are wooden, but it is possible to find pitting in older metal needles. I believe carbon fibre can occassionally get knicks along the length. Cable connections are also a source of catch but I’ll talk about that seperately. 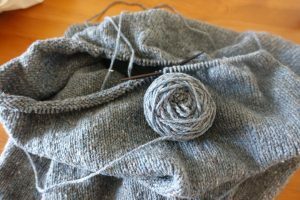 The needle tip needs to have a sufficiently sharp point to suit the knitting project you are working on and that point also needs to be smooth. Wooden and softer plastics tend to have a more rounded points than acrylic and metal. Metal tips in particular can be very sharp especially if designed specifically for lace knitting. If you are using a circular needle with a cable – the cable needs to join as smoothly as possible with the needle, and have the flexibility you are comfortable with. Knitters have varying tolerance for how cables behave – I am on the tolerant side so don’t notice a huge difference unless it’s particularly unresponsive or “sticky”. Please comment if you have stronger views that may help a new knitter. Pretty much every needle you buy new, regardless of price will meet these criteria. However as soon as you move beyond a single material needle and join it with something else you add in places you can get a catch. So if you add a metal tip to a wooden or carbon fibre needle there is a potential catch point, if you attach a cable with a metal cuff onto the needle there can be a catch point, if you offer the option to be able to change the cable, you create a potential catch point for that join. Very few of us tolerate catching at those points very well. In particular cable connections are one of the main areas where needle quality is debated. So if all needles can do the job, why spend money on better quality needles? Simply because the right needles for you are nicer to knit with. A couple of years ago I went to a knitting gathering here in Kuala Lumpur and I forgot my knitting. A knitter visiting from Thailand loaned me a garter stitch project she was working on and despite one of the needles having a slight chip after 30 minutes of knitting and chatting I had to ask her “what is this needle?” She glanced at it and told me it was an old Lantern Moon interchangeable. Unfortunately you can not get Lantern Moon needles any longer and I will always regret not biting the bullet and buying a set before they went out of production (they were 2-3 times the price of typical needles). That rosewood Lantern Moon was one of the nicest, most comfortable needles I have ever used and has become kind of my personal gold standard. A really good needle is light in your hands, has the right degree of slip so the fibre you are using moves across the needle smoothly, at a pace comfortable to you, and generally helps you knit efficiently. You shouldn’t feel like you are fighting the needle and if you are knitting for a couple of hours your hands should feel relaxed afterwards as opposed to cramping and achey. If you knit a wide variety of fibres and types of projects the right needle can be different based on project type or even the part of the project you are working on. As I noted in my first post I typically have difficulty knitting for any length of time with metal needles so there is a bit of a skew in my descriptions to other materials. I also realised that I probably need a glossary post of techniques e.g. magic loop, top down, bottom up, in the round etc which I may write another day . Quality also includes the issue of manufacturing defects and wear. The more needles of a brand that are in circulation the higher the number of knitters who are going to experience a manufacturing defect at some point in their experience with that needle. If you knit a lot chances are you will deal with needle/cable failure at some point. In IT we talk about the more complex the technology the more points of failure are introduced and that is definitely true of cable connections on interchangeable needles. I will talk about defect issues as I go but for those of you reading with prolific knitting experience I would also suggest you keep wear in mind. When I am sewing garments I change the machine needle regularly – I expect the point to get blunt and for the tip to possibly break. While a good quality needle investment can be significant, compared to how much many of us spend on yarn, its worth being mindful that needles do wear and with circulars the cable is the weakest point. When a cable gives out at the join after being used in multiple projects, or a well used tip strips it’s screw it may be annoying but if it has served its purpose well – then maybe its just time to replace it. In many knitters’ minds there are these fabled “grandma’s needles” which lasted forever; when in fact most of the grandmas I know replaced their needles on a fairly regular basis as the tips wore, the metal finish roughened, the old casein plastic became brittle with age and snapped. While it can be lovely to have a pair of vintage tortoise shell needles I wouldn’t use them for everyday knitting. So having covered all that – I am going to run through the massive pile of works in progress I have at the moment which have multiple different needles in them and talk about what I like and don’t like. While typically my examples are using circular needles most brands are also available as straights and DPNs if that is your preference. Jon’s Hearthstone in Brooklyn Tweed Shelter. This project is for my youngest son (who is 6’2” so there is a lot of knitting) It is knit in Brooklyn Tweed Shelter which is woollen spun and quite a “crunchy” yarn. It’s not soft and slippy like merino and possibly if I wanted to risk my hands would be easier to knit on a metal tip. I have used four different needles on this project – the bands and the first 10 cm of body knitting were done with Knitpro Royale interchangeable tips, the bulk of the body was knitted with a Pony Rosewood 80 cm fixed circular and the second sleeve I switched from the Royale to a Knitpro Trendz (acrylic) tip. The body of the first sleeve was done with a Knitpro wooden Symfonie tip. So lets start with Knitpro (Knitters Pride in the United States). 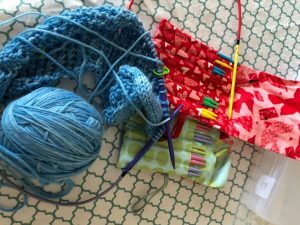 When I first got back into knitting sufficiently to consider refreshing my needles – Knitpro was the first option readily available in the interchangeable space. And the concept of an interchangeable needle was a significant influence in the move to knitting everything on circulars. At that stage they were available mainly as Symphonie wooden tips and Nova nickel tips in both regular and short versions. They also produced an acrylic tip (Spectra and Trendz), carbon fibre and more recently a wooden needle with a metal tip (Royale) and an aluminium version (Zing). I think it would be fair to say that there was a point when there seemed to be quite a few manufacturing defects with Knitpro cables – it was almost as if they had sourced a bad batch of fittings. For a while it seemed everyone had a story of a needle tip or cable not working properly. However it could also have been the sheer number of needles in circulation and the amount of garments they had knitted (if you have 10,000 needles in circulation and a 1% rate of manufacturing defect – thats 1000 needles, even a 0.1% will have a 100 stories circulating – which in NZ is a lot) So I am going to go out on a limb and say – given the number of Knitpro needles I have sold compared to the number of needles and cables that end up in the faulty box (hundreds compared to maybe a dozen over six months) this is a solid, reputable needle and a great place to start if you want to try an interchangeable circular. It was noticeable in Europe that a number of needle suppliers where distributing KnitPro under their own branding e.g. Prym. Of all the Knitpro needles acrylics have the worst rep. The acrylic circulars (Trendz and Spectra) have a nasty habit of the the tip chipping and are more inclined to loosen where the tip joins the metal screw fitting. While they have a more limited life expectancy, the price reflects that. Because of these issues a number of NZ Knitpro stockists no longer stock them, although they are still available, and I’m sure most of them will order in if you would like to try them. If you are a tight knitter it is possible to snap them but they are far more flexible from 3mm up than almost anything else available. For me – this is a needle tip I keep going back to with bigger projects when my hands are tired. I like that the points are sharper than wood, the needle is a bit more slippery, they are very light and the flex works well with my knitting style. The Trendz and Marble versions are colour coded by size, and one of the nice things about acrylics is they have a very wide size range at the upper end making them cost effective for a one off project. If you have arthritis in your hands and still struggle with hand pain despite having switched to circulars and wood these are worth a try. I don’t like them quite so much when I have a lot of fabric weight on them – for instance in this project I used them to magic loop the main part of the sleeve but used wood for the body. Yes, there are better needles out there, but these are still a great needle option. I did the Hearthstone bands with KnitPro Royale which are a new addition to the range. When I first saw the Royales, apart from the fact that they were coloured by size, I was attracted by the metal tips on a wooden needle. I thought this could be a good option for lace projects where I find wooden tips are not always sharp enough. I like them as needles and have done several projects on them – including a colour work jumper for Elliott, but I’m not quite convinced. It probably doesn’t help that it was a 3mm Royale tip I snapped while doing a cast on for that project, and I am concerned that the metal tip adds an extra potential catch point. When using the 4mm on Jon’s Hearthstone – I think the wood shaft was just a bit too grippy with the stickiness of Shelter and the mix of material (metal tip then wood body) was subconsciously confusing. It was as if I expected my knitting to move more smoothly as if it was on metal. The next project I am going to try them with uses silk and I’m interested to see how that works out. These could be a great needle for a knitter who prefers wood as a material but likes the precision of metal tips and the stability of a metal needle (less flex) I also think the straights and DPNs would be a lovely needle choice if you prefer those and do a lot of knitting where you want a precise tip. Symfonie are KnitPro’s laminated wood needle which along with Nova metal tips are probably the needle tip many of us started with as an interchangeable. It has a very small degree of flex at small to medium sizes and the points are reasonably good in smaller sizes. There is a bit of a catch 22 for manufacturers as the finer you make a wooden needle point the more fragile it can become. The challenge is finding that sweet spot between sharp enough for managing stitch patterns while sturdy enough not to splinter. Being wood these needles can break and most of us who use them have at had at least one moment where we have sat down on or stepped on knitting and heard an ominous crack. I personally prefer these to a bamboo tip – something about how they feel in my hands. They work with a wide variety of fibres including cotton and soft wool blends. While I am on the topic of Knitpro is worth adding in my experience with Nova and Zing. Nova is a nickel tip – a small percentage of knitters are allergic to nickel (you may already know this from jewellery and watches containing nickel) And it is a metal needle so should be approached with caution if your hands fatigue quickly using metal. The nice thing about Nova is that it is very slippery – maybe too slippery if you are working with something like silk or are making your first foray into fine laceweight yarn, but great for working on a project with a yarn like Shelter. I had forgotten about it until I was looking for something else, but I started a Twigs and Willows with it last year using Nova and it was definitely easier. 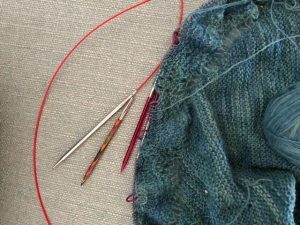 I actually can work with Novas for a reasonable length of time before my hands start to protest – I have got older Nova tips showing a distinct curve from my technique but they tend to be at the bottom of my list for needles at this size. Zing are aluminium and are colour coded by size. They are very pretty needles and are actually a close favourite for me to my acrylics and wood. The brushed finish means they are not quite as slick as a Nova but the yarn still moves very smoothly across them. I haven’t used a garment weight pair of tips long enough to tell if it will warp and I haven’t used them for a sustained knitting session to the point where I might notice fatigue so the jury is still out. I use Nova and Zing a lot more for sock knitting so will get a bit more in depth in that post. The back story on this needle is that when Tash and I were at H+H Cologne in March one of the main things we were looking for was a new range of knitting needles so customers had a choice. I was on the hunt for something as good as, but maybe not as Rolls Royce priced as the rosewood Lantern Moon I had fallen in love with. Just as we were leaving on the last day and as Elliott was losing it a bit (after being brilliant most of the time we were there) I ducked into the Pony stand as I had spotted a different needle at the bottom of a display stand. They had some out as testers and in the five minutes I had to knit a row it felt like it was pretty close to my Lantern Moon experience. So I used Google to track down an online supplier when I got home. It was harder than I thought and I am not convinced what I bought was quite the same – the European one had a slightly different cable attachment. However the needles were definitely an improvement on the Royale for slippiness on the body of Jon’s Hearthstone. 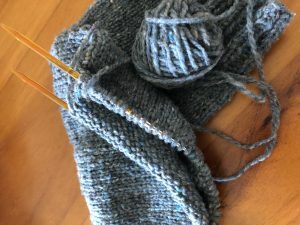 Having knitted over 40 cms with them my biggest issue would be the cable isn’t quite right – it felt like I was tugging at it to move stitches along quite often. I also had a minor issue with the needle points not being as smooth as they could be, but that could have been from damage in transit (they had slid out of the bubble wrap within the envelope). These are an expensive needle ($24 US before postage) compared to other more easily available options and I don’t love them enough to recommend them. The needle was close to the feel of Lantern Moon but the lack of swivel and drag on the cable made using them harder than it should have been. I’d like to have another look at the sample set and see if it was different as the rep commented it had a swivel join which the ones I got didn’t have. If you are in Europe and see them – possibly worth checking out. There are needle sizes that you use all the time and have heaps of and then there are the sizes that you only use occasionally. This is where having at least one set of interchangeable needles can come into its own. Vianne needed 5mm needles when my others were otherwise engaged so I pulled out my Denise sets. The Vintage Purls Max I’m using was an Unwind final day “have to have” purchase from several years ago. Denise are an earlier brand of interchangeable needles that have been regarded as good starter set at a lower price point in the United States. I believe they may have had some erratic supply issues at one stage when the business ownership was transitioning but I have not had any problems ordering them. To my knowledge they are not stocked by any yarn stores in New Zealand and if you are interested it is more straightforward to order them direct from Denise. Apart from being curious about the way the needle and cable click together, and how a plastic needle would perform, I was attracted by the very cute portable sets, especially as I travel so much. These are a soft plastic needle that click into a slightly thicker cable than most interchangeable sets. They come in a limited size range that doesn’t go below a 3.75 mm. They have both a standard length tip and a short tip option and you can choose which colour range you would like – grey, pastels or primary. Both the sets I have bought came in a very compact little fabric case which folds in on itself and is great to have in your bag when you are away for several weeks. At the 3.75 and 4mm size I found they almost have too much flex but for the 5mm this project needed they are fine. In a perfect world I’d like the needle to be a touch longer but once I have got back into the rhythm they work well with my technique. The rounded tip takes a touch more concentration with lace (this pattern has a k2tog, yo sequence across most of the back) but the best way I can describe this is that they are very mentally undemanding needles – you can focus on the project rather than be distracted by the tool. And despite my comments about the smaller size, when I switched a doll’s coat project onto them from straights over the weekend it felt like my hands gave a sigh of relief. 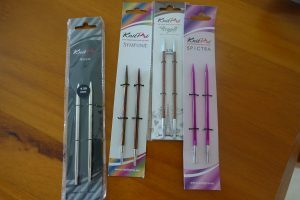 There are not many New Zealand knitters using these needles, but if you need a very forgiving needles for your hands this is definitely a brand worth checking out. I started this project not long before Knit August Nights in either 2014 or 2015. I love the colour of this Vintage Purls Sock and Myrtle just seemed a perfect pattern for it. Being bottom up and sock weight it was always going to be a mission of a project and being on a 3.5/3.75 mm the smaller needle was already a challenge in Symfonie. As I was finding wood a bit sticky and the pattern has a lot of lace I thought it would be a good project to test out a Chiaogoo needle. Chiaogoo have become the needle of choice for many knitters. They are light, smooth, have a great cable join and come in a variety of lengths and configurations that other brands don’t have. The needle is stainless steel which makes it usable for knitters who have an issue with nickel, and also ensures it is pretty robust. I really wanted to like Chiaogoos but after 4 (long) rows my hands were beginning to cramp and after 6 rows I stopped. As you can see – so did the project. I’m thinking of trying a KnitPro Zing or a Lykke when I pick it up again. 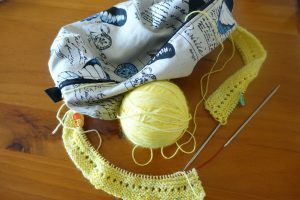 I didn’t totally give up on Chiaogoo – in Malaysia it is hot enough that I have projects I might only knit two or three rows at a time so I asked Morag to send me another pair of tips with an extra long cable for another project. The project I needed it for is Rachel which uses a semi traditional Shetland approach of creating a very lacy shawl by knitting laceweight on a larger needle – in this case a 5mm. It starts with a centre square and then picks up the border for the lace. The garter centre panel was much better on the Chiaogoo tips compared to Symfonie but when I picked up the lace border and had to purl I began to notice the stitches seemed to get stuck at the needle neck. If you look closely there is quite a sharp narrowing at that point compared to the taper of KnitPro wood and acrylic – this isn’t unique to Chiaogoo as the Knitpro Nova is very similar. This is an edge case for a needle of this size – it’s unusual to use this thick a needle to knit a shawl using this yarn weight. But it is worth mentioning as many knitters turn their attention to shawls like Bubbles after Neve Ardern-Gayford was introduced to the world wrapped in one. This generation of older patterns quite often need this disproportionate needle to yarn. It took me quite a while to figure out why the stitches weren’t moving smoothly. Assuming you have no issues with a stiff metal needle the Chiaogoos are definitely worth considering. I would suggest you try a cable and tips in a size you use frequently before you order an entire set – beautiful as those sets are. They do have less movement than nickel and aluminium (I have managed to gradually bend a 4mm nickel needle which I certainly can’t imagine doing with a Chiaogoo) In the case of Chaiogoos I trust the knitters I know who love them when I recommend them. I haven’t tried the bamboo tips mainly because I am pretty comfortable with the options I already have but I probably should try and do that in August and do an addendum post. It is a good idea to buy an individual set of tips and a cable in a size you use a lot for any brand and knit something before you go ahead and purchase a full set of interchangeables. I feel a bit like I have run out of breath! I am going to finish this post here with a promise to do a sequel within the next few days. 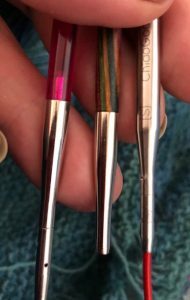 I also wanted to talk about knitting small circumferences – and there are at least three more brands of needles that deserve covering including my potential new close to perfect needle. Plus I think there is a discussion to be had about when to choose/buy interchangeables versus fixed circulars. I am pressing pause for the moment as I am hoping a parcel arrives shortly from Anne at Wild and Woolly in London with a Japanese bamboo needle that she really rates. I’d like to add that in as another outlier, plus I am tracking down an Addi Click (I use Addi for socks rather than garments). There is also how well Hiya Hiya, Clover and Lykke stack up in my quest for the perfect needle. In the meantime I am going to do a quick post about a project I did over the weekend which reduced the seams in a vintage doll’s coat pattern. It covers the approach and also ended up creating a simple next step pattern for a novice child knitter. Thanks for reading and commenting – I really appreciated the feedback and encouragement. And last but not least I will be at Knit August Nights and will have all the needles I have discussed with me – so if you would like to catch up and try out some of the less common brands let me know and we can arrange a time. ← So what’s the deal with knitting needles?